I just got my postcard order from Moo.com and I must say they did a terrific job! It is just amazing to me how inexpensive printing a color, glossy postcard is these days. I remember well when it was unaffordable to print just a few cards like this. They were only $1 a card! 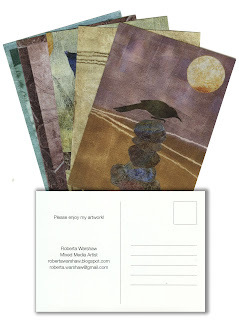 I ordered 20 different cards so that I would have a variety to choose from to send to Kat Sloma for the Liberate Your Art project. As you can see, I put my blog address and e-mail address on the back so people will know where and from whom their piece originated. I have been energized to mail my art away ever since participating in Jane Davies postcard swap to save her rural Rupert, Vermont post office. I think it is a great way to get your work out in the world. To release it from the confines of the studio where, at least in my case, it piles up and piles up until there is nowhere left to put anything. Not everyone has the time or energy to do craft fairs or to have gallery shows. My life is such right now that I barely have the time to get into my studio at all. So for me, this is quite a perfect way to put it out there. This particular swap requires the cards to be printed and not to send the original piece, but that is OK. I will send the original art whenever it is required and for this swap I will send the printed art. Postcards: Helping keep mail alive! Wow, these are terrific, both the art and the printing. I've been pleased with the mini business cards from MOO. Nice to see the postcards. It's so funny, so many people I "know" in blogland are participating in this swap this year and, as far as I know, they don't know each other. I'm doing it, too, and I just ordered from moo, too, for the first time. I participated last year and also did a few side swaps with participants so it's a good thing you have extras. I'm thinking of you because of the blizzard. Hope your power is on. Are you coming up to Phoenix when you're in AZ? No. I have never been to Phoenix. I hope that when we come out for longer periods when my husband retires, we can explore the area more. For now though it is just a week in Tucson! well, what a grand idea. plus the postcards look terrific. but then they are of your work, so how could they be anything else. what a grand idea. the postcards and your art are fantastic. Your art / postcards are really fantastic! I'm participating too. I signed up just now. This is going to be great fun! Thanks for putting this up on your blog.